This challenging, flexible and diverse programme offers specialisation in any one of ten humanities and social science subjects, combined with a broad base in European history, law, philosophy and politics, and fluency in a European language. Year three is spent at a European university. A humanities or social science subject (or Mathematics) preferred. Mathematics at A* required for full Economics specialism if chosen. French or Spanish required if one of these is to be studied as major language. A humanities or social science subject (or Mathematics) at grade A preferred. French or Spanish at grade A required if one of these is to be studied as major language. Mathematics at A* required for full Economics specialism if chosen. A score of 19 points in three higher level subjects, with no score lower than 5. Higher level subjects to include French B, or Spanish B at grade 6 if either of these is to be studied as a major language. A humanities or social science subject (or Mathematics) at higher level is normally a requirement. Mathematics at grade 7 at higher level is required for the full Economics specialism, if chosen. A score of 17 in three higher level subjects, with no score lower than 5. Higher level subjects to include French B, or Spanish B at grade 6 if either of these is to be studied as a major language. A humanities or social science subject (or Mathematics) at higher level is normally a requirement. Mathematics at grade 7 at higher level is required for the full Economics specialism, if chosen. D2,D3,D3 in three Cambridge Pre-U Principal Subjects. French or Spanish required if taken as major languages, plus a social science or humanities subject (or Mathematics) preferred. Mathematics at D2 required for full Economics specialism if chosen. A1,A,A at Advanced Highers (or A1,A at Advanced Higher and A,A,A at Higher). French or Spanish required at Advanced Higher if taken as a major language, plus a social science or humanities subject (or Mathematics) preferred. Mathematics at A1 required for the Economics specialism, if chosen. Successful completion of the WBQ Advanced Skills Challenge Certificate plus 2 GCE A levels at grades A*AA. French or Spanish required if one of these is to be studied as major language, plus a social science or humanities subject (or Mathematics) preferred. Mathematics at A* required for the full Economics specialism, if chosen. A year abroad at a continental university - exchange places with partner universities include Berlin, Bordeaux, Brussels, Hamburg, Madrid, Milan, Paris, Seville and Rome. Undertake a dissertation on an independently chosen research topic, with specialist supervision. Wide-ranging employability: approximately 15% of ESPS graduates have gone into European, international or British politics, 20% into law, business and commerce. Introductory modules in the first year allow you to develop your interests and identify an area of specialism for later years. Your modules then fall into three groupings: common core, language (and culture), and a specialism in the humanities or social sciences. The European common core involves working in a multidisciplinary environment, gaining insights into a range of academic disciplines and engaging critically with competing analytical perspectives. You will undertake language study throughout the programme, selecting one language, or in some cases two, on which to concentrate. Your third year is spent abroad, in a country where your choice of major European language is spoken. In your final year you return to UCL to continue with advanced modules in your language(s) and your humanities/social science subject, and also write your dissertation under the supervision of a member of staff. You may also take a second language as a minor language from those listed above, as well as choose from a wide range of other languages, including Arabic, Czech, Finnish, Hebrew, Mandarin, Polish, Serbian, Yiddish, Classical Greek or Latin. If you are taking the full Economics specialism you will also take 1.5 credits from UCL Economics, and will take no optional modules, or minor language. You will select 1.0 credit in a humanities or social sciences subject, or in a minor language. You will select 2.5 credits in your chosen area of specialisation. You will select 2.0 credits in your chosen area of specialisation. Your formal timetable will involve a programme of lectures, seminars and workshops. As well as the core modules, and modules designed specifically for ESPS students, you will choose options in other departments according to your area of specialisation. This gives you access to a range of UCL's successful teaching approaches. Your work will be assessed by written examination, assessed essay and presentation. 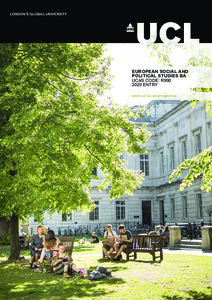 Detailed course descriptions are available on the department website: European Social and Political Studies BA. ESPS gives you the wide-ranging employability of graduates in PPE or international relations, but with the added maturity of a year abroad, and the advantage of fluency in a European language – essential for anyone seeking a career in a European context, and increasingly valuable for the financial sector or media posts. ESPS graduates combine specialised knowledge of a humanities or social science with a broad foundation in European philosophy, law, history and politics and, importantly, proficiency in another language or languages. In addition, they gain independence from a year studying abroad. In particular, students are able to demonstrate their aptitude for research by writing a dissertation. This unique combination yields a significant advantage when it comes to securing funding for further research or getting a foothold on a competitive career ladder. Outside academia, potential careers may include politics, law, business, commerce, teaching, public relations, journalism or IT. When we assess your application, we will be looking for a firm interest in social and political issues, including a demonstration of your ability to grasp theoretical concepts and analyse social trends. Your achievement in examinations is crucial but we also pay careful attention to your motivation and interests as expressed in your personal statement, and your referee's report. If you live in Europe and you meet (or are expected to meet) our selection criteria, you will be invited to an assessment day. This will involve sitting the Thinking Skills Assessment Test (at UCL) and taking part in a discussion group chaired by ESPS staff. If you are resident in a country outside Europe you will be interviewed by telephone, and asked to submit an essay on a set topic written under examination conditions. You should state clearly on your UCAS application which modern European language you wish to study as your major language. Please state both if you are taking two major languages. It is not necessary to state the minor language if you choose one. Further information about the languages offered and their specific requirements can be found on the ESPS website.